Damon Carlton and a Polar Bear lives ! 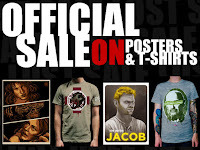 Emails have started arriving to registered users that DCaaPB are celebrating the LOST Auction with a new limited edition T-Shirt, which you can only buy at the auction, and also announcing a sale on existing posters and t-shirts. Don't forget that anyone attending the auction and turning up in LOST related fancy dress will be in with a chance of winning a prize. It isn't only Damon Carlton and a Polar Bear that will be at the auction, Entertainment Earth have sent emails saying they will also have some LOST collectibles at the show, and also have mentioned a prize of a complete collection DVD set for the best costume. ObFuSc8 has pointed out that she is not sure what a "Camara" in the last image to the left is ! The words "sale" and "LOST" in the same sentence are such a temptation. I guess it wouldn't be DCaaPB without a typo here or there. Doubt anyone would bid on "Hurley's Camara" whatever that is. Sale? did someone say "sale"?! i wonder if any other show has ever milked it's fans for more money? i need to sell a kidney to afford more LOST stuff! kidney, anyone? kidney for a good cause? 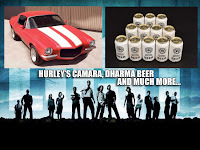 If I had the money I'd bid on Hurley's Camaro no matter how they spell it. 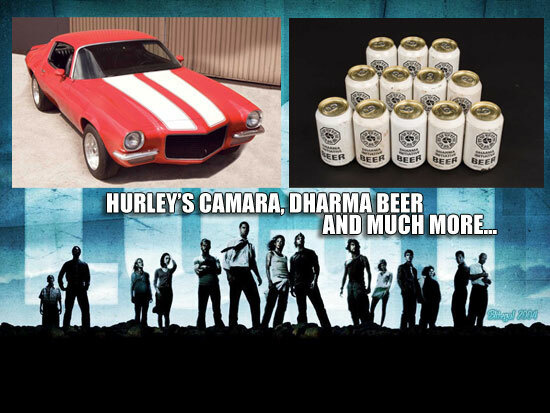 ;) I'd love the Dharma cab too. They're definitely are squeezing this turnip for all it's worth. 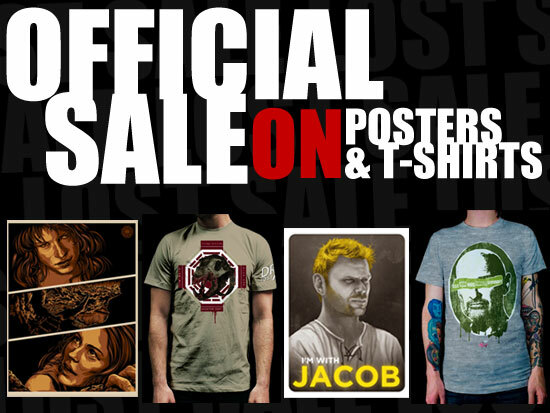 Does the lower prices inspire anyone to buy a new poster or shirt from dcaapb.com? Just kinda bummed I bought a Jin and Sun print (which is beautiful) and I could have still gotten one, but now cheaper. $20 saved is $20 i could use. I'm home. I have a tumor the size of a golf ball between my eyes, They aren't sure if it's pituitary or something else. Still running tests now. its nice to know why I'm dizzy, tired and can''t see well. now they just have to figure out if I need radiation or surgery or both. I even got a photo of it lol But I have to say that it was nice to see what the hell it is that is causing me so much pain. well, if I had endless $$ and no worries, I would be going for the van. Maybe something decorative for the yard. ok, off to take a nap, thanks for all the well wishes. Just got this email from Entertainment Earth. Besides Tyson/Givens I wonder who else are the special vendors? Feeling a little Lost lately? Don't worry... your favorite ABC show is back for only two days: Saturday, August 21, and Sunday, August 22. Celebrate the Lost weekend at Lost: The Official Show Auction & Exhibit at the Barker Hangar located at the Santa Monica Airport in delightful Santa Monica, California. A whopping 1,174 lots are for sale! See the Dharma Van, view the Swan Station Hatch, and even sit in an Oceanic 815 plane seat... plus much more! Bring your camera and take advantage of some great photo opportunities! Entertainment Earth will be one of a select group of exhibitors at the show, and we'll be bringing some awesome collectibles that you can buy while you're there! Go to http://www.profilesinhistory.com/ for tickets and more information regarding this special event. Can't be there in person? Participate in the auction online and via phone. Calling all die-hard Losties: Come dressed as your favorite Lost character. Each day at the convention, one lucky winner with the best likeness will win the Complete Collection DVD set! @Lisa: Wow, that is something. Sometimes it is better to know exactly what is causing your symptoms and attack it! Not knowing would be terrible. Best wishes that this is attacked fast and furious! Yes, I think anyone following here has the idea. There are multiples of the props and costumes,-there is no guarantee that anything was used onscreen- except maybe the fish biscuit machine -at this point. It still would be neat to have even the backups of some of the items-but the prices are too high for me in the end. Are the ARGers not meeting up Saturday morning?? ?